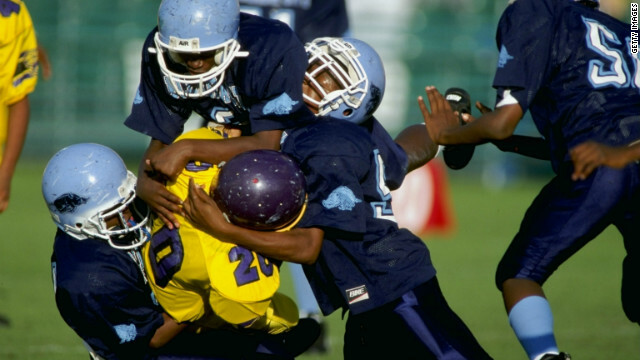 As more people learn about how football's hard hits to the head can lead to brain trauma, fewer parents may be willing to let their kids out on the field. That's according to a new poll released Wednesday by HBO Real Sports and Marist College Institute for Public Opinion. One in three Americans say knowing about the damage that concussions can cause would make them less likely to allow their sons to play football, the poll found. Keith Strudler, director of the Marist College Center for Sports Communication, who helped oversee the phone survey of more than 1,200 adults in July, said this could be alarming news for the future of football. "Historically, youth football has fueled the NFL," said Strudler. "Parents' concern about the safety of the game could jeopardize the future of the sport." Strudler added: "You know, what we are measuring are attitudes. Attitudes towards football. The interesting thing is how much these attitudes will turn into behaviors. We found that 14% of people feel less comfortable watching football because of this knowledge. What's going to be interesting is to watch in the future...if that 14% will shut off their televisions." Strudler is also curious if these attitudes will continue to change over the next few years. The poll also found that 86% of adults in the United States have at least heard of the connection between concussions and long-term brain injury. While about 40% of Americans said this information didn't really change their concern about the game, another 32% said they were more concerned about the game. Another 30% Americans polled were less concerned because they felt coaches and parents were more informed and can take greater precautions. Still, 70% of respondents thought the benefits of playing football outweighed the risks. Yet, nearly 1 in 4 Americans believe the risk is too high. Josh Pruce, National Director of Scholastics and Media Relations for Pop Warner, says there hasn't been a drop in numbers in the youth football league. Over the past decade, numbers had been steadily increasing about 1 percent, and holding steady in 2011 and 2012. Numbers for 2013 aren't available yet. Pop Warner is the largest football league in the country, with over 250,000 kids between the ages of 5 to 15 participating in its games. "Safety is Pop Warner's number one priority. We've implemented a number of rules to make the game safer," said Pruce. "We follow the 'when in doubt, sit it out,' rule . We also have lowered our contact rules, where you can only make contact 1/3 of the time in practice." He also added that there is a no head-to-head hitting rule when players are more than 3 yards apart. Maybe 86 percent have heard about the concerns, but the parents are still sending their boys out to the field. I have a family member with 4 boys in football. I can't see the sense of letting your child get hurt, and get permanent damage from a GAME. Something you do in high school and then have to live with the consequences for the next 70 years. Do parents just not care? Or not believe it will happen to their child? Now we have former pros suing due to damages they sustained while playing. So maybe they did not know what could happen. But now we do, so why are so many parents still allowing their children to be hurt? I don't get it. My experience playing High School football, back in the day, we were taught, for self preservation, to slide our heads either to the left or right and use our shoulder when making a tackle. There were no full face masks as are used today which help make the player feel invincible and encourage the use of the helmet and mask as a extension of the body which it is not. We had fewer head and neck injuries and conversely more rib and body injuries back then because no one in their right mind would try and stop an opposing player going head to head with a helmet sans a protective face mask. Anyway the game has changed, the players are stronger, bigger and smarter today and I would last about 10 minutes in a HS game today even though I was an All State running back. Just an observation that the more we surround the players with protective armor , the more serious the injuries seem to be. Just a function of our "extreme" society where kids are looking to make the highlight reel like their NFL heroes. Good coaching will teach a kid you don't tackle with your noggin. When you see a guy get paralyzed or worse it almost always looks like they were going for the big stick instead of the "safe" tackle.